'Shockwave' is a browser plug-in produced by Adobe Systems. It is similar to 'Flash' in that it packages a large number of capabilities useful in creation of educational software. 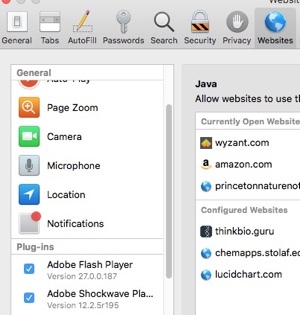 However, increasing concerns about security have lead some browsers to require specific permissions for different websites before such software is allowed to run. This page describes how to test and enable Shockwave in order to run several thinkBio modules. ***BasePairer in Director on Mac/Safari yields an incredibly annoying flicker; modern version here. If needed, you can download an installer from Adobe's website. Note: if you're 'doing everything right' and still having issues, we sometimes find that using the uninstaller first (it comes packaged with the 'get shockwave' download) to get past really sticky wickets.